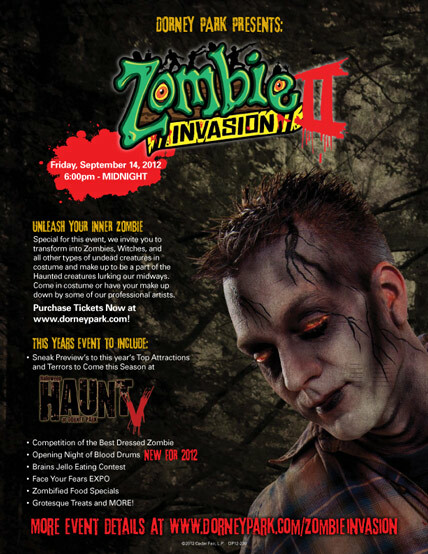 Dorney Zombie Invasion Sept 14th! Next NYC Crawl Oct 14th! We’re happy to announce our next main NYC Zombie Crawl event in Manhattan on Sunday, October 14th will feature our biggest afterparty yet! We’ll be announcing location and plenty of surprises in the coming weeks so stay tuned! And don’t forget, Friday, September 14th there is the 2nd Annual Zombie Invasion of Dorney Park in Allentown, PA! You can BUY YOUR TICKETS NOW HERE! Put in NYCZOMBIE as the user name and password (all caps) for the good deal! Many more details coming soon, there is also a 5K Zombie Run through Dorney Park on Saturday, Sept 15th so you can make it a zombie weekend! And on Saturday, November 17th D20 Burlesque presents Return of the ZOMBIES! Also, here are 2 videos that NYC Zombie Crawl helped produce, a NY State Lotto Commercial that we helped cast and a music video for Angelo Moore aka Dr Maddvibes (also the frontman for the legendary FISHBONE) that we co-produced and was shot in part at our NYC Zombie Crawl event in Manhattan last October. See if you can find yourself! October 16th Wrap – More October Events! So another successful NYC Zombie Crawl has been completed, we had over 1000 zombies at the peak of the evening! Thanks for all those who crawled and bled with us as well as the Beauty Bar NYC, Continental, Arlene’s Grocery as well Angelo Moore, God’s Green Earth and of course Nassau Chainsaw DisGraCeLand Demolition Committee! We will have photos and video soon, in the meantime you can check out a NSFW gallery over at VillageVoice.com from our pal Nate ‘Igor’ Smith. Remember to upload all your pictures to Facebook and your ZombieBooth pictures to their Facebook page for our contest to win an iPhone 4S! (see below). 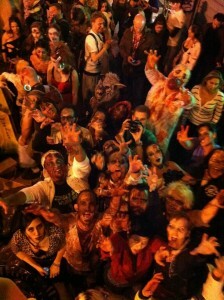 Also, check out some more photos from the Halloween 2011 NYC Zombie Crawl here! Those who attended the event know that our dear friend and brother Spliff, the father of DisGraCeLand passed away the morning of the crawl after a year and 3 months of fighting his way back from a horrible car accident. Spliff has been with the NYC Zombie Crawl from the very beginning and DisGraCeLand has been a part of every event we’ve done. The news devastated everyone but we pulled through and performed for Spliff. All of the raffle proceeds and a portion of the profits and bar tabs will be going towards his funeral fund which is this Saturday. You can donate to the cause and help his family at the paypal link at this website. We still have a zombie filled October with many events in multiple cities! Here is a list with links for more info, with more to come! Oct 21-23rd – Asbury Park, NJ – NJ Undead Festival – 3 days of zombie madness! All day! Oct 29th – The XXXorcist LIVE at SMack NYC Halloween Fetish Ball – Encore performance! Also Thrill the World NYC, part of the international dance to Michael Jackson’s Thriller day is taking place at 10am and 10pm on Oct 29th! Go to the site for details and come to the SMack afterparty, which goes till at least 4am! And don’t think we forgot about the Zombie Beauty Pageant! We’ll be hosting the 4th annual event at the Beauty Bar NYC December 18th so stay tuned! Also, remember that the all new Blood Manor is in a new location in NYC (163 Varick Street) and DisGraCeLand Hook Squad will be performing every Thurs-Sunday in October and into November! Finally, want to remind our zombies to download the ZombieBooth App on your smart phones and upload them to the ZombieBooth Facebook Page! You could win an iPhone 4S! There is a free lite version to try it out. our undead 3D zombie photo for the chance to win an iPhone 4S*! Next Crawl – October 16th – Manhattan!! We’re gearing up for the main crawl event this SUNDAY October 16th! Pabst Blue Ribbon will be hosting an open PBR bar at the afterparty and a photo booth starting at 8:30pm and we have a new sponsor with an awesome product we’ll be promoting – ZOMBIEBOOTH! 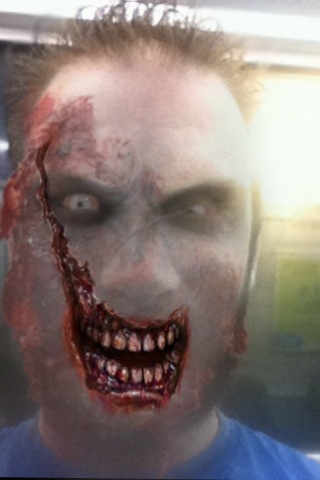 It’s an awesome mobile app that turns anyone into a 3D Zombie! We have a funny powerpoint presentation about the Walking Dead and we’ll also be doing the late night HOT ZOMBIE CONTEST again! A portion of the proceeds from the event will go to help our brother Spliff, the father of DisGraCeLand Hook Squad – you can also donate here! Download the ZombieBooth App as we will be doing some afterparty ticket giveaways to the first 10 people to post pics at the event on the ZOMBIEBOOTH Facebook Page! It’s all going to kick off at the Beauty Bar NYC by Union Square (231 E 14th St in Manhattan btwn 2nd and 3rd Ave). from 4pm-6pm with the zombie meet up and makeup. Our zombie makeup technicians will be charging a small fee to create zombies or you can bring out your dead! It’s 21 to drink zombie drink specials or enter the bar, but all ages are welcome to join us for the crawl event at 6pm! At 6pm the madness begins as we crawl through the East Village. This year we’re honored to have Angelo Moore aka Dr. MaddVibe (also frontman of the legendary Fishbone) as a part of the event! We will be shooting the crawl as part of a new Dr. MaddVibe music video and Dr. MaddVibe will also be performing at the official after party! After shooting for the music video and on the way to the final stop, around 7:30pm we’ll take a break at the Continental NYC (25 Third Avenue between St. Marks Place & 9th St.,New York, NY 10003), $2 Pabst Blue Ribbon 16oz cans and home of the “$10 for 5 shots of anything” special, need I say more! The location for the official after-party is ARLENE”S GROCERY (95 Stanton St, New York, NY 10002) and will start at 8:30pm. It’s 21 + and tickets are $10 if you are a zombie, $12 for civilians. FREE Pabst Blue Ribbon from 8:30pm-9:00pm! Zombie Comedy, Sideshow and Burlesque – more surprises to come! Late Night HOT ZOMBIE CONTEST with prizes from The Walking Dead and more! We’ll be premiering clips from Punk Rock Holocaust 3 (starring Angelo Moore) as well as Cross Bearer and The Cemetery! We’ll also be doing a sneak preview of PUNK ROCK HOLOCAUST 3 and showing a trailer for season 2 of THE WALKING DEAD! Prof. Johnny von McNulty is the world expert, and he will be giving a lecture sampled from one of his Great Series of Lectures. This time the subject is The Walking Dead. You can see his alter-ego Johnny McNulty many places including http://www.boners101.com and Harold Night at the Upright Citizens Brigade Theater in New York. He also contributes writing to SNL and the Onion. Sponsored by Pabst Blue Ribbon and Shaw Promotion! Check out the write up on FoxNews.com about crawls all over the US, the NYC Zombie Crawl is top of the list! Also check out more info on Fangoria.com and CityUnlisted! Also, if you’re in the mood for horror movies, check out this short horror flick we entered into the ABC’s of Death contest! It’s NSFW and sick! Please vote to help us win a spot amongst the 26 short movies! Click here to watch! Murder can happen on the Vans Warped Tour! PS: We will also be announcing the winners of the Punk Rock Holocaust filmmaker contest at the next event!! PPS: Our friends at the NJ Zombie Walk has their crawl and Undead Festival on October 21-23rd! Both NJ and the Philly Zombie Crawl are part of our new zombie alliance NEW WORLD ZOMBIE – more info on this soon! !